Krissy and Scott were married at an outside ceremony at the Keystone Ranch. This beautiful valley is just west of the Keystone Resort and ski area. We enjoy this quiet spot that you're able to call your own for a moment in time. Actually, not too long ago we dressed up this very spot for a 50's themed wedding. And that's the beauty of it, you can do whatever you want. There are no rules when it comes to modern weddings. No matter what, it's fun to look back and one thing we'll be doing more is interviewing couples and see what thoughts and feelings they want to share about their real mountain wedding. And that's exactly what this blog is about, sharing the real stories of real mountain bride and grooms and the way they put their mountain experience all together. Q. What was the most memorable moment you had at your wedding? Q. What would you do differently looking back? A. Our wedding was a small, “destination style” event, with a total of 26 people. We hit the perfect weekend of the aspen trees turning yellow, it was 70 degrees and there was not a cloud in the sky. I’m not sure we would have changed a thing…except I wish we’d gotten chance to meet the pastry chef Ned Archibald (Keystone) who made our cake. Being out-of-towners, we didn’t get to sit down for a live tasting of all the flavors he can do…and his cake was incredibly good! Q. Any "hindsight 20/20" advice you have for couples? A. Advice: Pay attention to the STYLE of the various photographers. Even though we learned that our photographer had never previously shot at Keystone Ranch, we knew we liked his artistic style, and trusted him to create artistic shots. Steve Tinetti was PHENOMINAL! Every single detail of our event was beautifully captured in pictures forever. We have a lot of friends (some of whom are photographers themselves) who were blown away by his work. Q. What resources, vendors, websites and magazines did you get inspiration or help from? A. We reside in Houston, TX and the decision to get married in Colorado came from a breakfast conversation. 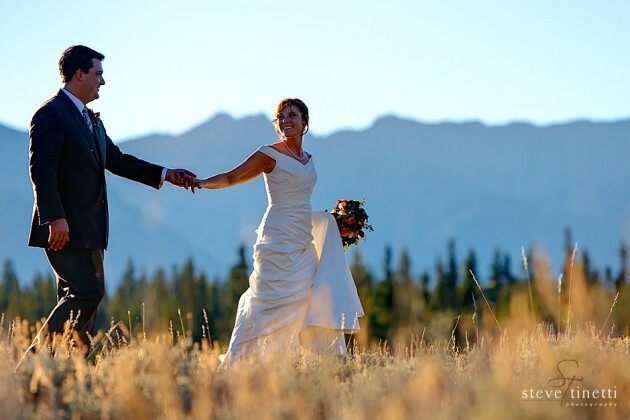 From there, we first looked at websites for weddings in Colorado. The real help, though, came from when we were selecting photographers. You can find a lot more pictures that give you a true idea of what your day will look like by paying attention to the location of the weddings they had shot. For flowers, we wanted something simple and unique that wouldn’t break our budget. After looking at hundreds of pictures of flowers, my wife finally turned it over to the designers at Petal and Bean. What we got was nothing short of perfect. They even added a few details better than we had envisioned for ourselves. We were a MUCH smaller event than the wedding they had done the day prior to ours (at the same location) but they made us feel just as important.